I have a well-worn pair of Paramo's Cascada-s that have been a favourite of mine through several year's winter walking ... so I was looking forward to trying out the newer Velez Adventure trousers. I wore the Velez for several days' walking around the Cheviots in early Spring - conditions were varied ranging from cloud with a moderate wind to bright (even warm) sun. At just under 390 gms, the Velez are certainly lighter than my trusty Cascadas (500 gms) - they are also less bulky so have a much more flattering fit. I was wearing the size 12 and I think the sizing is pretty 'true'. However, at 5' 7'' - I would have preferred a little more leg length. Leg length aside, the Velez were really very comfortable and there is virtualy none of the rustle you often experience with waterproof trousers. They sit just below the waist (they come with their own belt so that's where they stay) and the freedom of movement is very good. As I'd expect, the breathability of the fabric is excellent and there are two long, zipped vents on the outside of each thigh to give additional flexibility with temperature control. These zips were consistently easy to use without any snagging. I've only worn the Velez so far in relatively light rain which didn't pose any problems - I was perfectly dry and the trousers dried really very quickly. They also did a good job in keeping out a pretty brisk wind. There is no cargo-style pocket but I was quite happy with the two side, zipped pockets for keys, lip protectant etc. The heavier (ie sturdier) Analogy fabric is still in evidence around the backside, and legs (thigh to mid-calf at back, thigh to just above ankle at front). So far there's been no evidence of damage after various excursions through a variety of Northumbrian hiil 'scrub' but it's perhaps too early to come to any real conclusions about durability. 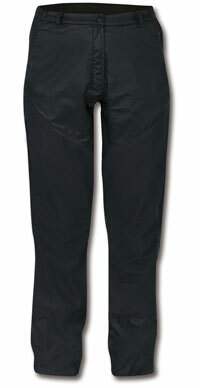 The Velez Adventure are a really very fine pair of walking trousers. They are expensive but an investment worth considering as their lighter weight makes them usable pretty well all year round. Check the leg length on the women's versions.